In the chaos of early-1990s Russia, a paralyzed veteran's wife and stepdaughter conceal the Soviet Union's collapse from him in order to keep him--and his pension--alive, until it turns out the tough old man has other plans. 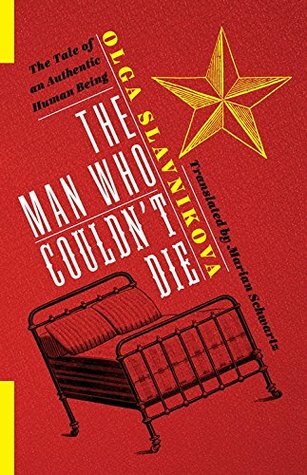 An instant classic of post-Soviet Russian literature, Olga Slavnikova's The Man Who Couldn't Die tells the story of how two women try to prolong a life--and the means and meaning of their own lives--by creating a world that doesn't change, a Soviet Union that never crumbled. After her stepfather's stroke, Marina hangs Brezhnev's portrait on the wall, edits the Pravda articles read to him, and uses her media connections to cobble together entire newscasts of events that never happened. Meanwhile, her mother, Nina Alexandrovna, can barely navigate the bewildering new world outside, especially in comparison to the blunt reality of her uncommunicative husband. As Marina is caught up in a local election campaign that gets out of hand, Nina discovers that her husband is conspiring as well--to kill himself and put an end to the charade. Masterfully translated by Marian Schwartz, The Man Who Couldn't Die is a darkly playful vision of the lost Soviet past and the madness of the post-Soviet world that uses Russia's modern history as a backdrop for an inquiry into larger metaphysical questions. The Man Who Couldn't Die is an interesting piece, but it's probably not going to be one that appeals to all readers. It is a deeply introspective work that considers not only the human psyche and metaphysical conundrums but also modern-era politics. In the latter respect it is a timely work, as it could also be said to represent more recent events in the Western world. I enjoyed the dilemmas the piece posed; however, at times I felt somewhat distanced from the characters. I would have liked to have established a stronger connection with them. Then again, that separation may have been a conscious decision on the part of the author. Either way, this is not an 'easy' or light read, so I would only recommend it to those who like a good dose of heavy introspection and philosophy in their literary fiction.